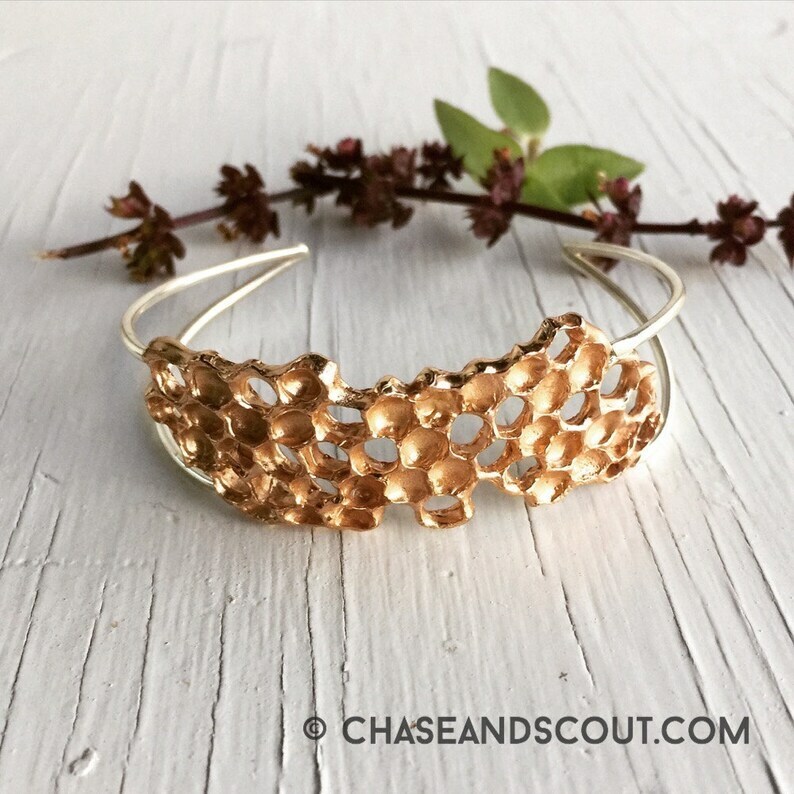 Organic Honeycomb Cuff Bracelet in Bronze and Sterling Silver. Casting fragile and transient organic materials into solid metal is an art form unto itself, and it's one of our favorite things to do in the studio! Cut into fine slices measuring roughly 2.5" x 1" these are very lightweight and comfortable to wear. Hand hammered and formed to follow the curve of your wrist, this bracelet sits close to your wrist and looks stunning when worn. **See Last Image for an idea of how to measure your wrist. ** If you do not have a fabric measuring tape, you can use a strip of paper to mark your measurement and then measure the strip against a ruler. An avg wrist size is between 6.5" and 7". Please do not add in extra length for comfort, I'll make sure that happens on my end. These are slightly adjustable and you will be able to make some adjustments yourself. Made of solid golden bronze with a double sterling wire wrist cuff. This piece is created using traditional lost wax metal casting and fabrication techniques - many of our original works have received design copyright awards from the US design patent office. This unique piece of art jewelry is cast from a natural honey comb slice. Please allow up to two weeks creation time prior to shipping. Beautiful bracelet. Seller customized sizing for me. Very easy to work with. I bought this item for my mother as a gift from her first grandchild to announce my pregnancy. She decided many years ago her grandma-name would be “Honey” - so this was a perfect fit. She absolutely loves it, very well made, shipped wrapped in a beautiful box with ribbon and arrived several days before I was expecting it based on the estimated time table. I can only imagine the rest of the shop’s goodies are equally well made and stunning. Arrived quickly and is absolutely lovely and unique and delightful to wear. Am deeply satisfied with this purchase!